Once upon a time, an elementary class was studying how to use commas in lists. Just as they were deciding what to write, Miss Dawn, the school custodian, popped her head in the door. “Don’t forget your recycling this week, class,” she said in her usual friendly way and she walked on down the hallway. “Let’s make a list of what Miss Dawn does at school!” said one student excitedly. Miss Smith, the teacher, wondered if the list would be long enough, but she agreed that they could try. The teacher wrote “Miss Dawn…..” on the board and she left a space to begin the list. The students started making the list for the chalkboard. “She washes our desks every day,” said Joe. “Yes, and she takes out our recycling and trash, too,” chimed in Susan. Every time they thought of something else Miss Dawn does, the teacher listed it on the board. The list got longer and longer. They put things like “mop and vacuum the floors, clean the boards, dust the rooms, help in the cafeteria during breakfast and lunch, wash all the windows and glass doors, help with composting, do indoor car duty, clean the restrooms, empty the pencil sharpeners, put student artwork on the walls, run copies, and water the plants.” The list began to get so long; the teacher had to get more chalk! “I saw her pressure washing our sidewalks,” said one student. “She picks up the trash outside and trims the bushes, too,” added another child. “I’m on the flag patrol and Miss Dawn is our sponsor. She helps us put the flags up in the morning. She told us how we should be careful and not let the flag touch the ground,” said Tommy. As they were writing, the teacher next door came by to give Miss Smith some books and saw the list. “I bet you are learning about how to use commas in lists,” she said. As the lesson went on, more people stopped by with suggestions for the Miss Dawn list. One of the teacher assistants told about the way Miss Dawn helps on picture day. “Yes, she helps walk students to the photographer and makes sure hair bows are straight and hair isn’t sticking up,” said John. The students all agreed. “Yes, let’s write about Miss Dawn, the best custodian in the whole world!” they all shouted. “We can use our Miss Dawn comma list!” Miss Dawn happened to be walking by on her way to vacuum and she heard her name. When she glanced in the room she saw the loooooong Miss Dawn list and a BIG smile came over her face. “You have left just one thing out,” she observed. “Let’s add Miss Dawn gives hugs!” All the students jumped up and gave Miss Dawn a big group hug. 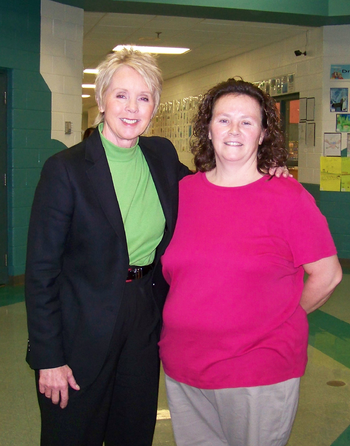 Dawn Barker, custodian at Alpha School in Morristown, TN, deserves recognition for her work ethic, positive attitude, initiative, and skill. Most of all she should be recognized as an inspiration to our students and staff to always give their personal best. She certainly does- each and every day!